One year ago today, 7 July 2017, 122 countries voted in favour of The Treaty for the Prohibition of Nuclear Weapons (TPNW)! 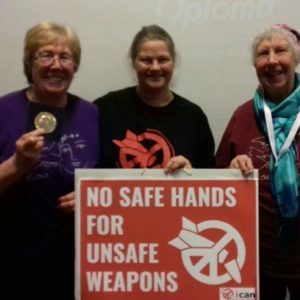 As the first legally binding international agreement to comprehensively prohibit nuclear weapons, it hoped to one day totally eliminate nuclear weapons. In the 12 months since, 59 countries have signed the treaty committing themselves to the eventual ratification of the TPNW in their jurisdiction and 11 have even ratified it bringing its contents into their rule of law, with the last of these being Costa Rica which did so on 5 July. Ambassador Whyte of Costa Rica chaired the negotiations of the treaty last year, now having followed through her country’s commitment to the treaty. Sadly, no nuclear states, including the UK government, attended the negotiations. Looking forward over the next year, driving action to put pressure on our government to become the first nuclear state to sign the treaty is a must from us! Find out about our TPNW campaign and our upcoming events here. Today though is a day of celebration! We are so proud to have been part of the making of history! You can also read how WILPF has been involved in the beginning of the end of nuclear weapons here.